Vileplume in game: 429 Who? Important notice! Pokemon Vileplume is a fictional character of humans. 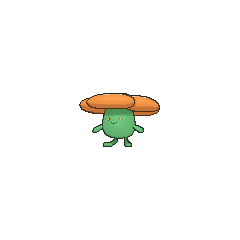 Vileplume (Japanese: ラフレシア Ruffresia) is a dual-type Grass/Poison Pokémon introduced in Generation I. It evolves from Gloom when exposed to a Leaf Stone. It is one of Oddish's final forms, the other being Bellossom. Vileplume is a blue, bipedal Pokémon with rudimentary hands and feet. It has beady red eyes and a massive red flower growing from its head. 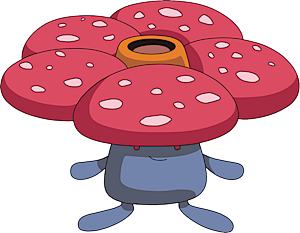 Vileplume's flower is said to have the largest petals in the world, and is almost too heavy for the Pokémon itself to support. The rounded petals of the flower are red and covered with white spots. The female Vileplume has fewer, but larger, spots on its petals. It can shake, flap, or burst its petals into bloom with a bang in order to release clouds of pollen. This pollen is highly allergenic to humans and toxic to other Pokémon; Vileplume uses it to paralyze its prey. It can also utilize these petals in its former signature move, Petal Dance. Vileplume lives in grassy plains, where it is often mistaken for native flowers. Vileplume's first major appearance was in Holy Matrimony!. The Flower Pokémon was under the ownership of James's fiancee, Jessebelle. Prior to the flashback when James ran away from home, it was once an Oddish. It reappeared in The Treasure Is All Mine! when Jessebelle used it to open a blocked passageway. In Mewtwo Strikes Back, a Vileplume owned by Neesha was among the Pokémon that were captured and cloned by Mewtwo. The Vileplume clone was seen again in Mewtwo Returns. Ash, Tracey, and Jessie were affected by a Vileplume's Stun Spore in The Stun Spore Detour. Multiple Vileplume were among the feuding Pokémon at Professor Oak's Laboratory in Bulbasaur... the Ambassador!. Groups of Vileplume and Bellossom were feuding with each other in Whichever Way the Wind Blows. Nicolette used a Vileplume to battle May's Munchlax in May's Egg-Cellent Adventure. Multiple Vileplume appeared in Bucking the Treasure Trend! where they attacked Ash and his friends. Vileplume first appeared (as a cameo) in Pokémon Scent-sation!, being one of the Pokémon owned by the attendants at the Celadon Gym. Vileplume also appeared in The Kangaskhan Kid. One was seen at a party in The Battling Eevee Brothers. Multiple differently patterned Vileplume appeared in Poké Ball Peril. Multiple pink Vileplume resided on the Pinkan Island in In the Pink. A Vileplume under the ownership of an unnamed Trainer was treated by Nurse Joy in The Joy of Pokémon. Vileplume also appeared in The Power of One and Destiny Deoxys. Two Vileplume were seen at Professor Oak's Laboratory in A Tent Situation. Multiple Vileplume appeared in Foul Weather Friends. A Trainer's Vileplume appeared in The Grass Route competing in the Grass Tournament. 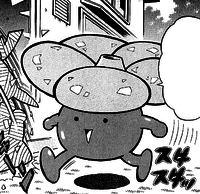 In Extreme Pokémon!, a Vileplume appeared with its Trainer, participating in the Extreme Pokémon Race. A Vileplume was one of the Pokémon seen in a forest outside the Ice Path in EP250. A Vileplume was seen being fed by Tracey at Professor Oak's Laboratory in Johto Photo Finish. A Coordinator's Vileplume appeared in Hi Ho Silver Wind!. A Vileplume appeared at the start of Leave It To Brocko!. It was running through the forest throughout the night after being woken with a shock when a Nuzleaf fell out of its tree, hitting the Vileplume on its head. A Vileplume also appeared in Pokémon Ranger and the Kidnapped Riolu! Part One. A Vileplume made a cameo in Arceus and the Jewel of Life. Multiple Vileplume appeared in Thawing an Icy Panic! in Ramos' ranch. A Trainer's Vileplume appeared in Under the Pledging Tree!. A Vileplume appeared in A Showcase Debut!, under the ownership of a Pokémon Performer participating in the Coumarine City Pokémon Showcase. EP048 Vileplume Ash's Pokédex Vileplume, the Flower Pokémon. Using the largest flower petals in the world, it spreads large clouds of pollen that cause allergic reactions. EP110 Salveyo weed Ash's Pokédex An effective Stun Spore antidote can be be made by boiling the leaves of the Salveyo weed. Salveyo weed is found on clear lake bottoms wherever Vileplume live. Poliwag are also found in the vicinity of this plant. A Vileplume appeared in File 3: Giovanni under the ownership of Erika. She used it to fight Red's Charmeleon and lost. Brock presents a Vileplume to the Sensational Sisters as a makeshift bouquet in The Human Race and the Pokémon Race. 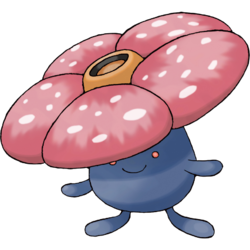 Vileplume first appeared in Blame it on Eevee as one of the Pokémon owned by Erika, its powerful Petal Dance attack being its forte. Erika has used it in a battle against Red in Meanwhile...Vileplume!. In The Last Battle XIII a Vileplume was one of the Pokémon sent to help the fight in Ilex Forest. In All About Arceus V, Ariana was shown to own a male Vileplume that was used to stop Silver from reaching the legendary Pokémon that Archer breed. Erika owns an Oddish which evolved into a Gloom and then into a Vileplume as part of an act. A wild Vileplume appeared in Operation: Capture Vileplume. Ruby has a Vileplume at his house as seen in Something Happened!! Let's Go After Pikachu!!. 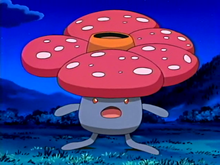 Vileplume is Erika's only known Pokémon. She sent it out to battle Satoshi's Charmeleon and got burned by its attack. Flaps its broad flower petals to scatter its poisonous pollen. The flapping sound is very loud. Scatters allergy-causing pollen from its broad petals. The larger the petals, the more pollen is scattered. It has the world's largest petals. With every step, the petals shake out heavy clouds of toxic pollen. The bud bursts into bloom with a bang. It then starts scattering allergenic, poisonous pollen. By shaking its big petals, it scatters toxic pollen into the air, turning the air yellow. Vileplume has the world's largest petals. They are used to attract prey that are then doused with toxic spores. Once the prey are immobilized, this Pokémon catches and devours them. In seasons when it produces more pollen, the air around a Vileplume turns yellow with the powder as it walks. The pollen is highly toxic and causes paralysis. Its petals are the largest in the world. It fiendishly scatters allergy-causing pollen from its petals. Its petals are the largest in the world. As it walks, it scatters extremely allergenic pollen. Moves marked with a superscript game abbreviation can only be bred onto Vileplume in that game. 51%-100% HP Let me dose enemies with toxic pollen! 26%-50% HP Hey, watch it. I'm down to half HP. Level up Yes, leveled up! You can count on me! From the center of the flower on its head, Vileplume spews clouds of spores. It attacks by scattering different kinds of pollen. It composes vines around itself that make Pokémon Slowed. Attacks do even more damage when you make a match of five. For other sprites and images, please see Vileplume images on the Bulbagarden Archives. Vileplume shares its category name with Bellsprout and Bellossom. They are all known as the Flower Pokémon. Vileplume, like Gloom, is based on the Rafflesia arnoldii, a foul-smelling flower known as the world's largest single flower. This Pokémon more strongly resembles the flower than Gloom, which may represent the budding stage of the Rafflesia. Vileplume's flower also looks alike several other species of Rafflesia, notably cantleyi, keithii, pricei, manillana and speciosa, of which the petal shape is a closest match. Female Vileplume may be based on Rafflesia hasseltii, as its petals have distinctively larger blotches than other species of Rafflesia. Vileplume is a combination of vile and plume or plumose (possessing filaments or branches that give a feathery look). Ruffresia is a corruption of Rafflesia. Cantonese Chinese 霸王花 Bawòhngfā A name for rafflesia. Literally "Tyrant flower"
Mandarin Chinese 霸王花 Bàwánghuā A name for rafflesia. Literally "Tyrant flower"